Dive Journal: We spend the late morning offgassing and unpacking our stuff at our new place at the Tradewinds. Although it lacks the charm of Hyacinth Cottage, the two-room apartment is nice and clean, with an adequate kitchen, foldout sofabed for the children, VCR-TV (with no signal), and even a functioning toilet (Hyacinth Cottage’s was sort of out of service). We’re glad there is a TV here, just as there was at Hyacinth. Linda and I have proclaimed this vacation an “unplugged” getaway – no radio or TV. The four of us are fine with that, but each evening we’ve decided to review that day’s diving video, and we find it is something we’re looking forward to every night. The afternoon dive takes us to a site called Three Pillars. Janel is playing videographer this dive, although I take over the duties once we’re back on top of the reef wall. Three Pillars is a splendid site in that you can’t really get lost! The mooring site is just a few dozen yards inland of three big pillar coral stands on top of the reef wall. I especially enjoy the wall here, a really nice vertical wall lush with growth. As we crest up and over the reef wall starting our return swim, we spy a turtle! 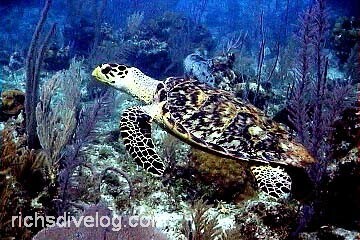 A small hawksbill, maybe only 20” long. We are very still and the turtle does a slow sweeping swim in front of us as we all hold our breath and stare. I’m really thrilled to have my camera for this event! The highlight of the dive. We also examine another nice whitespotted filefish in the shallows, an arrow crab and a nice longnose butterflyfish swimming around inside a barrel sponge. Linda from Manhatten finally admits she’s a little cold after this dive, her third of the day.